One of my fellow olive pickers from a French solidarity group asked me why we call settlements settlements, ‘Zaire colonies’ he said. How true, common parlance has diluted the true essence of the land grab in the West Bank. This was bought to mind an earlier occasion when we were supporting, by olive picking, the deputy mayor of Kafr Qaddom. 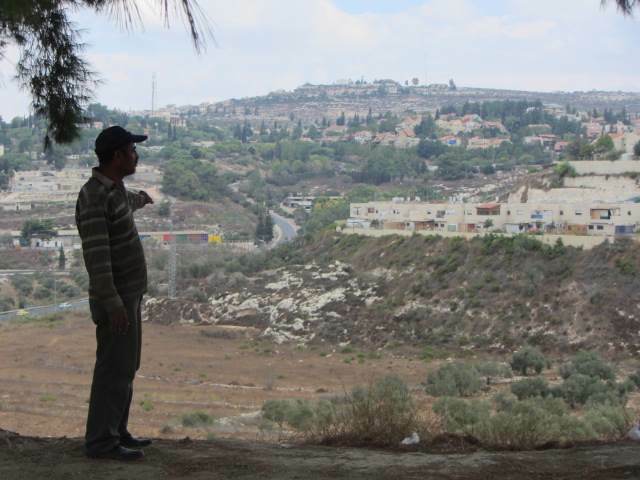 He gazed over the colony of Qedomim that has appropriated half of his village’s land. He and his brother had been attacked the previous day by around 100 settlers and the army were called. They told him to return the next day and they would offer protection. He asked for assistance from the international solidarity volunteers. As we picked olives I wondered why the soldiers their eyes fixed on us and not the settlement where the potential aggression might come from! I have been increasingly interested in how the West Bank land grab has happened. Below is a profile of Qedumim. Gush Emunin was an Israeli messianic and political movements committed to establishing Jewish settlements in the West Bank, the Gaza Strip and Golan Heights. It sprang out of the 1967 War, and was formally organised in the 1974 in the wake of the Yom Kippur war. In 1975 part of Gush Emunim tried to establish itself in Sebastia, north of Nablus. Eventually this was unsuccessful and they were evicted by the IDF and given temporary housing in Kadum a former Jordanian military base. In 1977, under the protection of Shimon Peres, the then Minister of Defence, Qedumim was given official recognition. Har Hemed is an example of an outpost that has been incorporated into a municipality. After Oslo Accords, it was agreed that settlements should not be expanded except by natural growth (although this was not exactly defined and whether it could include immigrants was never made clear). Outposts were not exactly legal either officially but received funds from governments ministries. By a process of naming them ‘neighbourhoods’ and zoning the area into a regional council the settlement could grow by stealth. 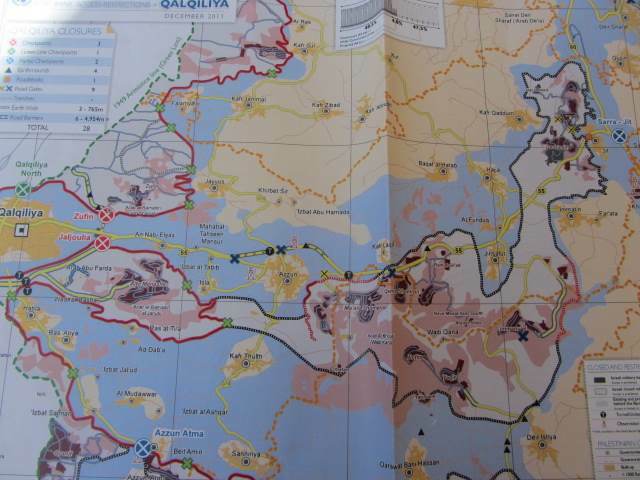 All municipal areas are off limits to Palestinians unless issued with a permit and are virtually enclaves. 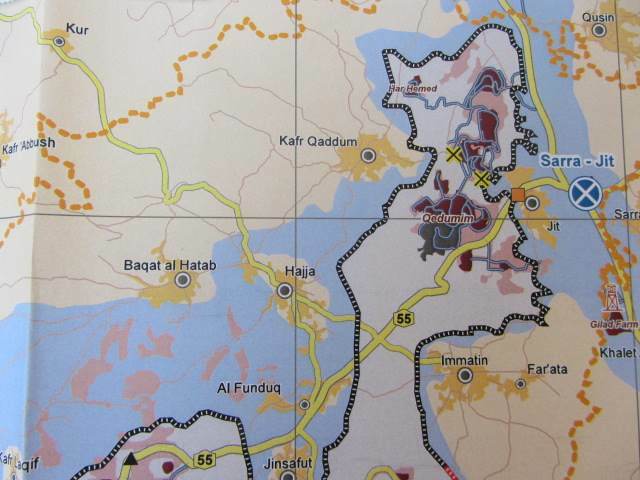 As the map indicates, if the proposed barrier is built (black dotted line) Qedumim could become parter of a much larger enclave together with the settlements around Wadi Qana, which is already categorised as a ‘natural reserve’. Closed military zones and nature reserves are tools used by the occupation to evict Palestinians and/or curtail agricultural activity. Apart from losing more than 50% of their land, this village is cut off from areas of their agricultural land by the settlement. Also, since 2003, access to their land and to Nablus has been affected by the closure of the linking road that passes by the settlement. This makes travel much longer: for a farmer with land the other side of route 60, it means a 10K journey via Al Funduk, it takes double the time to travel to Nablus. Farmers have suffered multiple incidents of aggression from the settlers. On the edge of the deputy mayor’s land is a house that used to be used by his father when he grazed his animals. He said it was frequently occupied by settlers who left trash and daubed the walls with Hebrew slogans. 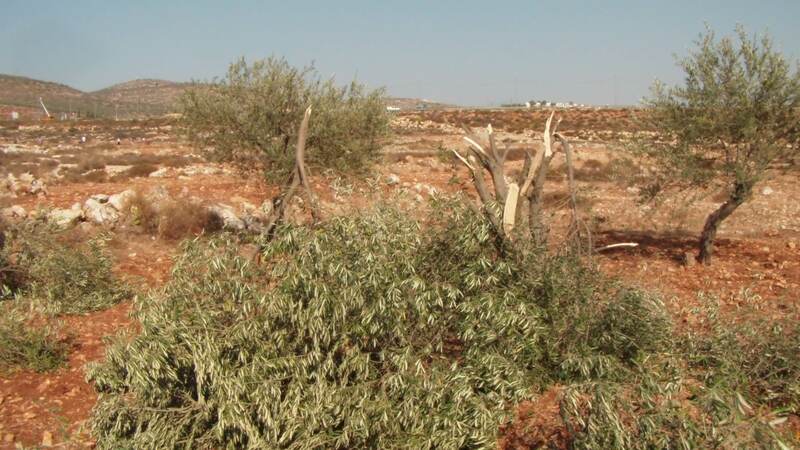 For more details of settler aggression see http://www.btselem.org, land confiscation and access links. Gush Emunim has declined as an organisation. However, its influence lives on and its raison d’être made more acceptable. This is encapsulated by one time mayor, Daniella Weiss, a right wing activist instrumental in the settlement’s expansion, who claims the settlement was built on a barren hilltop and is of strategic importance to Israel’s security and ‘must out pace the rapid, often illegal, building by Palestinian Arabs’. Although land grab can never be condoned, violent Palestine resistance can give the settler movement reason to feel threatened. In 2006, a suicide bomber who had hitched a lift, blew himself up at the gates of Qedomin killing 4 people 3 of whom lived in the settlement. The Al Asqa brigade claimed responsibility. 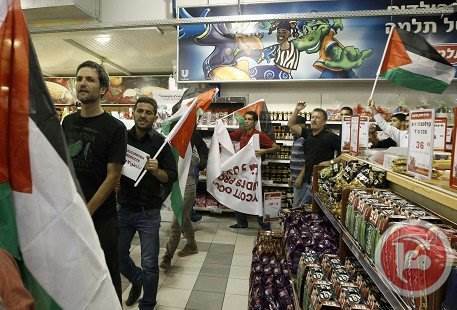 Two days later approximately 100 Palestinians and a small group of internationals demonstrated in a supermarket just outside the Shaar Binayamin settlement, near Ramallah. They left voluntarily when asked but were attacked in the car park by over 40 army and police using sound bombs. 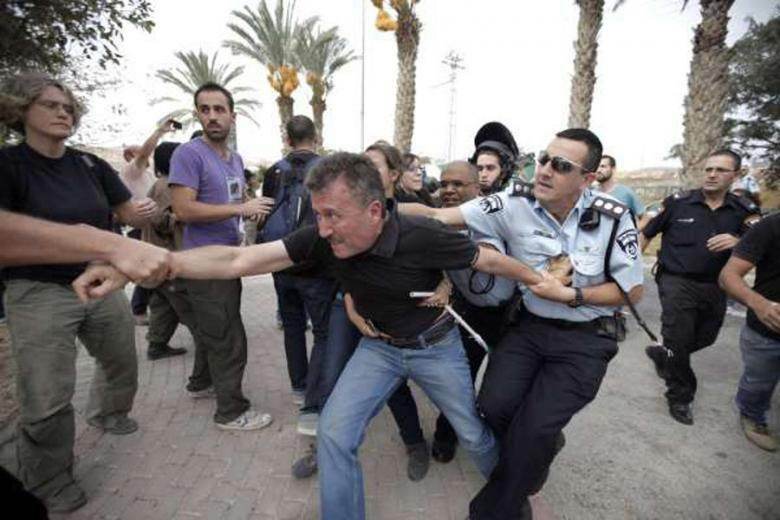 Two Palestinians, including our friend Bassem from Nabi Saleh Popular Committee, one international supporter from Michigan Peace Team, and one from International Solidarity Movement were arrested. All are still being held; the internationals are threatened with deportation by the Ministry of Interior although they have not been charged with anything. I am enthused to do more boycott solidarity work on my return…..the EU has legitimised Israel by the recent EU-Israel AACA vote. (Europe agreed to recognise Israeli standards, in effect making trade between Israel and European Union members much easier). The Palestinians continue to struggle against the stranglehold of the occupation, we need to do anything we can to support them.